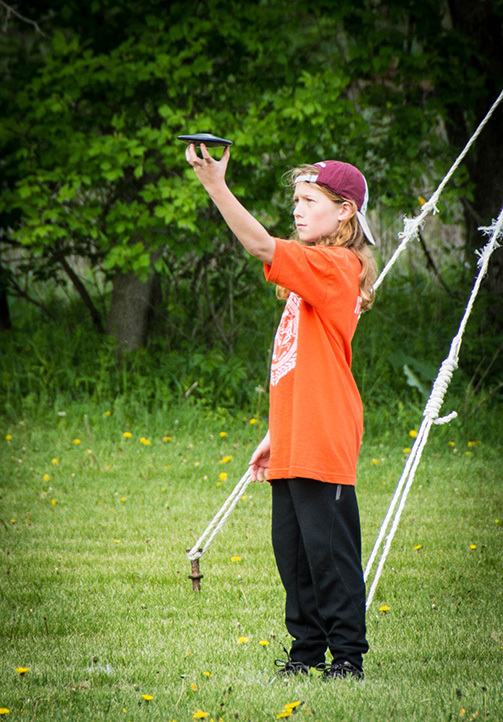 Every May the fifth grade class attends the Pentathlon in bucolic Viroqua, Wisconsin. 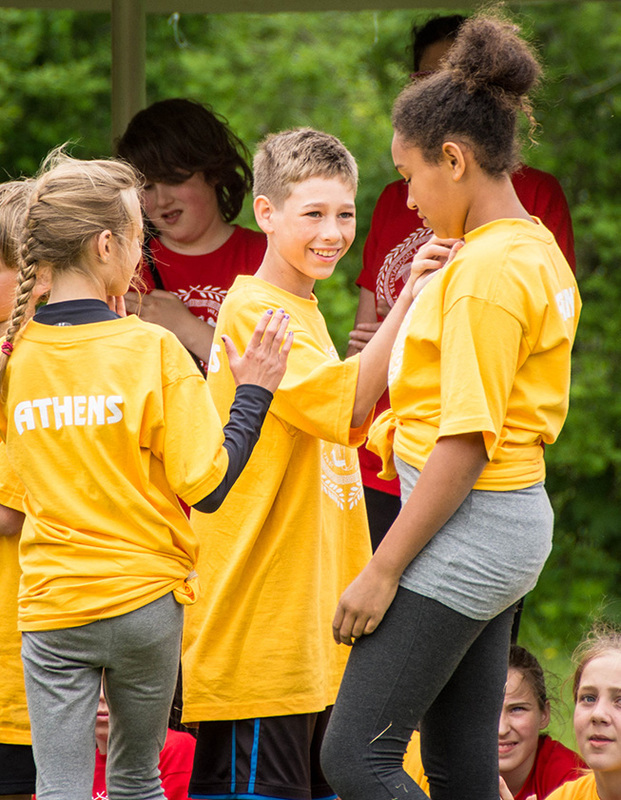 The Pentathlon is an Olympic-style games celebrated by fifth grade Waldorf students across the continent. For many years, City of Lakes fifth-graders have attended the Pentathlon with other Waldorf schools from Minnesota and Wisconsin. Students from CLWS and the other participating schools are divided into “city-states,” and compete in five events: javelin, wrestling, discus, long jump, and running. 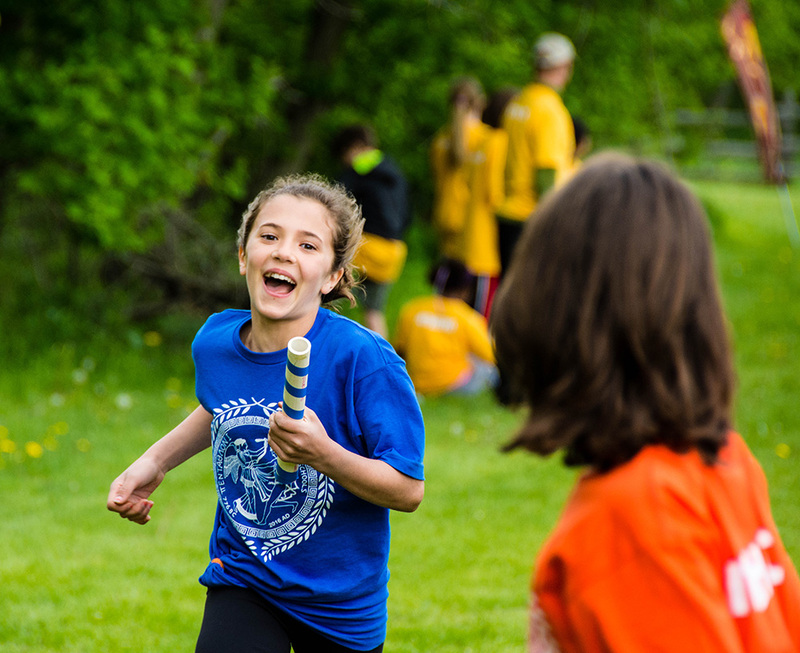 The Pentathlon is the culmination of not only the fifth grade social studies and language arts curricula, but of the entire primary grades curricula. Stories move from the magic and elemental mythologies of hunters and gatherers in the first and second grades, through the warlike mythologies of nomads and early agrarians in the third and fourth grades, and culminate in the study of Greek mythologies, as well as Greek art, philosophy, politics, math, and science in the fifth grade. The curricula of the impending middle school years will take a significant turn away from a more elementary or “elemental” consciousness to one more modern and individualistic. The child of 11 or 12 is at a major turning point in their development, the twilight of one major phase of development and the dawn of another. They are nearing the end of childhood proper and the beginning of adolescence. To put the Pentathlon in proper perspective, it is important to understand the relationship between childhood and adolescence. In an age when people have lost much of their innate understanding of childhood and its true relationship to the full course of life, it is important to give to childhood what belongs to it, and not drown it in the din of adult sensibilities. Childhood is the true foundation of our life here in the physical plane, and it is important and right that we pause to mark and celebrate childhood in full flower. That is the ultimate purpose of the Pentathlon. Adolescence as we understand it today did not exist several hundred years ago. It wasn’t that long ago that teenagers (as we call them today) ended their formal education and began learning a trade. The 13- or 14-year-old in pre-industrialized societies traditionally participated in some rite of passage initiating them into adulthood. Adolescence held no place in tribal or feudal societies. In these societies, children were taught societal and parental values, and they assumed societal roles predetermined by bloodline. Children were initiated into adulthood when they were able to physically and mentally perform the work their parents performed, and when they were able to create new life themselves. 13 or 14 is no arbitrary age. The traditional passing from childhood into adulthood at this age marked significant cognitive and physical changes occurring in the child. Adolescence not only marks puberty and the ability to reproduce, but important cognitive changes including a new clarity of thought we associate with abstract thinking and judgement. A cynical explanation of our modern understanding of adolescence is the need to train children into the increasingly complex technologies (physical and mental technologies) they must master to enter the modern workforce. An even more cynical understanding is society’s need to hold burgeoning intellects captive long enough to indoctrinate them into consumerism, sensuality (another form of consumerism), and business-as-usual. This is the shadow side of how adolescence functions in post-industrial societies. But that’s not the Waldorf way. 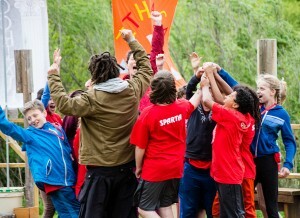 Adolescence in the Waldorf school marks the birth of the individual. And just as the infant—the physical newborn—must be protected from physical harm, the newborn individual must also be protected from harm. The Waldorf elementary school is similarly a protection of childhood, and the Pentathlon may be the most outward and enduring expression of our reverence for childhood and our understanding of childhood’s ultimate place in the course of a human life. The Pentathlon is often considered a rite of passage at our school and many others. And to some extent the event foreshadows adolescent changes to come. The javelin and the discus are vestiges of the hunt and harken back to rites involving hunting and sacrifice. And the attention to “measureables,” like distance and speed, foreshadow new cognitive abilities as well as future math and science studies. But the Pentathlon is not so much an adolescent rite of passage as a celebration. It is a celebration and glorification of childhood, a celebration bathed in the twilight of innocence. I like to think of it as akin to the dog days of summer, those impossibly long days and nights, without mosquitoes and thunderstorms. The Pentathlon has the quality of that last, August campfire, and how we forget for one perfect moment everything that came before and everything that will come after. Rudolf Steiner gives the picture of the body as a chariot, and our own, unique individuality as the chariot driver. Childhood is the period in life when we “build” our chariot. Adolescence is the time when we take the driver’s seat for the first time. Childhood is the building of our tribal, or what we might call our species, self. In childhood, each one of us builds a physical body or carriage for our individuality essentially the same to all humans (heart, lungs, limbs). And we socialize that body in remarkably similar ways (think of how similar children’s games are throughout the world). But at adolescence we enter a post-tribal stage, a stage in which we develop our own unique individuality. We become in effect a tribe of one. Steiner calls this body of individuality the ego. Erikson calls it identity. There are many names. Pearce calls childhood the stage of biological development, and he calls adolescence and adulthood the stages of post-biological development. But what is beyond biology?! The spirit of course! The Pentathlon, then, is a celebration of childhood, and of the body, the chariot. In fact, around fifth grade the child’s heart rate slows essentially to that of the adult. The fifth-grader’s limbs and body follow essentially the same proportions as those of the adult. There is a simple elegance and grace in the movement of the fifth-grader, a balance contrasted by the large heads of the third- and fourth-graders and the gangly limbs of the seventh-graders. I’ve often compared the 11- or 12-year-old to a brand new car, a car yet to be driven off the lot. (I guess the image of a chariot is more elegant. But Steiner didn’t grow up listening to the Beatles and Stones.) Yes, one can see signs of individuality in the young child. One can see personality, temperament, needs and desires, etc., but these elements are more associated with the make and model of the vehicle than with the driver him or herself. While personality and desire do shape the boundaries of how our individuality may ultimately be expressed, they have more to do with forces streaming from the past, forces like heredity and culture, than they do with the free and developing individual. And, in fact, personality may be considered a hindrance to the expression of our individuality as much as a representation of its core. Part of the ultimate expression of our true individuality is the undoing of personality and belief systems bequeathed us in childhood. Soon some of our fifth-graders will participate in Bar or Bat Mitzvahs, confirmations, or other rites of passage into symbolic adulthood. The eighth grade projects, the eighth grade trip, and, of course, the eighth grade graduation are all such rites. But the Pentathlon is not an expression of our human individuality. It is an expression of a humanity we all share. It is not a competition to see who is the strongest, or the fastest, or the cleverest. It is a celebration of the wonder and beauty of childhood in its fullest expression. In fact, pentathletes are judged not solely on how far, for example, they throw the javelin, but on how beautifully they throw, and how supportive they are of their fellow athletes. The overarching protective gesture of Waldorf elementary education is one that shields the young child from the powerful forces of individuality and ego. If childhood represents the building of the foundation for the rest of life, imagine what happens to the foundation when the frame or superstructure of the house is laid upon unfinished or unstable foundation stones. This is what happens when childhood is not protected and nourished. What happens are myriad modern social, psychological, and environmental pathologies. The Pentathlon is a celebration of childhood, a recognition of the beautiful stonework that will provide the foundation for true freedom in adult life. It is a perfect and still August twilight. Our Curriculum: No Heart Left Behind. Learn more about Waldorf education and how our curriculum is carefully designed to match each stage of your child’s development.